Lace front wigs represent the latest technology for non-surgical hair replacement in the world today. With a girlie lace wig you can SAVE YOUR EDGES and sew it on in 20 mins or less or even get a GLUELESS unit. A lace front wig when designed and constructed properly will be the closest thing to your own real hair, or can replace the hair you never had. It is the most natural, most beautiful, hair replacement system imaginable today. It is made out of real human hair and hand tied into a very sheer lace base one single hair at a time. It should look so natural that it can be virtually undetectable to anyone, even at a distance of only a few inches away. You can wear it for weeks at a time without removing it. You can comb your hair straight back, part it in the middle or even go swimming with it. There are no limitations to your look or lifestyle. You can shower, sleep, perm, wash or do anything you would normally do. You can finally have the hair you always dreamed about! Why do Lace Wigs cost so much? The technique used in tying or knotting hair by hand into the cap of the lace wig to simulate the look of growing hair. A fully hand tied wig requires 90-120 hours of labor to complete, which explains the cost of this type of wig. A lace wig is referred to as a “unit", "hair system" or "cranial hair prosthetic". Its hair extensions that create the illusion that hair is growing out of one's scalp, and therefore is one of the most natural looking hair extensions on the market. This illusion is achieved by the method of the lace wig construction. A fine lace material is used as the base where individual hairs are hand tied onto the lace. Lace wigs are made of individual strands of hand tied hair. The front is designed to blend into the skin with a natural look. It is attached with a special adhesive. What is a Lace Front Wig or a Full Lace Wig? The Lace Front Wig Is also acknowledged as a, Full Front Lace Wig, Front Lace Wig, or Lace Wig. What makes a lace wig different from a usual wig is with the purpose of the, Full Front Lace Wig, Front Lace Wig, or Lace Wig all have a unique cap that is made from a translucent lace. There are numerous diverse style caps - the most familiar is the full lace cap with ear-to-ear stretch. This cap technique has lace all around the outside and allows you to wear your hair in high ponytails and up-dos. They can also come constructed with a glueless cap. SAVE THE EDGES!!! Can I wear my lace front wig in a high ponytail? Yes, you can wear your wig in a high ponytail once you apply around your full perimeter with adhesives or you can also wear it in high ponytails with your glueless unit. You will need a cap construction that is made with lace around the perimeter. Full lace with a little stretch lace ear to ear, can be worn in a high ponytail. Full lace without stretch, can be worn in a high ponytail. Full lace with stretch lace from ear to ear, not the best option for a high ponytail. Lace Front Cap, Swiss Lace or French Lace in the front & stretch lace on the back, high ponytail not achievable. Silk Top cap, hidden or injected knots, stretch lace at crown, can be worn in high ponytail. Can I have highlights in my Hairpiece or Lace Front Wig? Yes, you can order your unit with highlights in your Girlie Lace Front Wig during or after creating your order Lace Front Wig. You must order virgin hair for light colors or highlights. Who can wear a lace front wig? Lace wigs are great for cancer patients, alopecia patients, anyone experiencing hair loss due to chemotherapy, or scalp disease. Lace wigs are for all cultures as well! The life span of your unit is based strictly on your maintenance. With proper care, your lace wig can last several months or even years. French Lace is the most durable and lasts longer than the Swiss Lace, which is thinner and finer. Virgin hair usually lasts much longer. How many colors can I use in my lace wig? 2 colors however we do not suggest adding more than about three (3). WHAT IS A FULL LACE WIG WITH STRETCH OR GLUELESS CAP? A full lace wig is a wig which the cap is constructed of a lace material. This material is Ultra Sheer Lace and is virtually undetectable when placed against the skin. Stretch lace is in a section in the back part of the cap which is right below the crown but above the nape. It also has adjutable straps. This allows you to wear your hair in a high or low ponytail. The hair is knotted twice to give the illusion it is growing from your scalp. NO GLUE IS NEEDED!!! I have lost all of my hair, can I wear a full lace wig? I have a head full of hair, can I still wear a lace wig? YES, all you have to do is braid your hair in small flat cornrows either in a beehive or straight back. Or you can wrap your hair flat back. Yes! If it is Remy, hair is 100% human hair and reacts to styling with natural water just like your own natural hair. The remy hair straight/curly/wavy textures curl up when wet, but they can easily be flat ironed for a straight look. Does the human hair tangle? No such thing as tangle free hair. Human hair tangles but good quality hair should have very little tangles. It can be a big problem if the used hair is not of good quality because this can increase tangling and matting. With good care and the correct hair care products you can extend the life of the hair and decrease tangling. However, we ensure the best quality hair and suggest virgin hair to prevent tangles. A knot simply is what holds the hair to the lace. Single usually are found around the perimeter or front of a unit and double are found in the middle and back of unit. Yes! If you choose a wig with the "freestyle" part option, you will be able to part the wig anywhere you choose, it's that simple. When you custom order a lace wig, you can also request your wig to be ventilated with a side part in it if you choose. Can curly or wavy hair be flat ironed? Yes! All of of units are 100% human hair so they can be flat ironed, however, we do not recommend that you flat iron very curly patterns such as Jerry Curl or Water Wave. Can I style my wig? YES! You can blow dry it, set it, hot curl it, etc. Remy Hair can be styled just like your natural hair. If you choose the curly/wavy hair option and flat iron it the curls will loosen just as you heat train your naturally curly hair hair to keep it from reverting to its natural curl pattern. Indian and Chinese Remy hair can be dyed a darker color than the original color. Virgin Remy hair can be dyed any color. How do I maintain my lace wig? How do I manage curly hair when it gets frizzy? Curly units can be a bit of a challenge to maintain. The key is to not get frustrated and experiment with the products that work best for you and your unit. We recommend that after washing your curly unit, you spray a leave in conditioner and let the wig air dry. We also recommend using John Frieda Frizz Eaze, which can be purchased here. Can I swim or exercise with my lace wig on? Yes! You will need to purchase a waterproof adhesive. We do not recommend swimming or exercising within the first 24 hours after applying your wig. Condition the hair immediately. However, the chemicals is the water could change the hair color. I personally put my unit in a ponytail and try not to get it wet but that is just a personal preference. Full lace without stretch, can be worn in a high ponytail or sew it on. Lace Front, Can be worn in high ponytails but have weft hair included. Glueless cap, if you have heavy edges or want to wear it up or with a bang. Can I still wear a lace wig even if I have a full head of hair? Yes, regardless of the amount of hair you have, you will still be able to enjoy a lace wig. You must secure your natural hair as flat as possible. We recommend that you either cornrow your hair going straight back or mold your hair in a circular motion. Can I exercise or swim with my lace wig? YES, lace wigs are just like your real hair, you can do normal activities with such as exercising, swimming, showering, sweating, etc. We recommend that you do not get your wig wet in the first 24 hours after you apply the adhesive. We also recommend that you use water proof adhesive. The hair is harvested from a single donor (in some cases it is necessary to use hair from two donors) and it's cuticles are kept in tact and aligned in the same direction to ensure manageability. If the cuticles are not aligned, the hair is more prone to tangling and matting. Girlie Lace Wigs recommends that you use knot sealer to seal your knots on the underside of your wig. Flip your wig inside out and be sure to protect the hair that is left out, you could use a plastic bag. Spray a light coat of knot sealer on the knots of the lace wig cap. You should seal your knots after every washing. Knot sealer is available at Love My Hair Boutique, please see our adhesives/solvents section. As an alternative, you may use clear acrylic spray, you may find this spray in your local craft shop. Also, you must shampoo and condition your wig, not washing your wig will cause the wig to shed. French Lace is delicate, yet durable. If you are a first time lace wig wearer French Lace is recommended because it does not tear as easily. Swiss Lace is slightly thinner, yet very delicate. This type of lace rips easily. It is best to learn how to apply lace wigs prior to advancing to Swiss Lace. What is Injection Silk Base Lace? Injection Silk Base Lace is the newest innovation to lace wigs. The base is made from 2 swiss lace pieces (one on top and one on bottom). The hair is tied using reverse ventilation, which involves tying the hair from the bottom to the top so the knots are hidden in the bottom lace. This gives the appearance that the hair is growing directly from the scalp. How do I dye the lace? Girlie Lace Wigs recommends that you only dye the lace that is visible (the front hairline and perimeter). Take a q-tip and dab it into Rit Fabric Dye, dab q-tip onto the wig cap base where you wish to change the color. We recommend you use a Rit Dye that is darker than your skin tone. How much lace do I cut? Girlie Lace Wigs recommends that you use a new pair of sharp scissors to trim the lace away. Make sure to leave 1/8" to 1/4" of bare lace. If you leave some of the lace uncut, if your lace begins to fray, your wig will not loose hair. The small strip of lace disappears when it is attached to your head. How do I prevent lace from fraying? Girlie Lace Wigs recommends that you use Fray Check. Fray Check can be purchased online at Love My Hair Boutique(TM). Please see the instructions under the product information on how to use Fray Check. What color lace should I choose? Choose the lace color that closely matches your skin tone. It is always better for the lace to be too light than to be too dark. Do I need a professional to apply my lace wig? Yes, until you lean on your own. However, glueless units can be taken on and off at your convenience. What do I do with my own hair? If you have long hair, you may have your hair cornrow braided in a circle or straight to the back. If you have thin or short hair, you may wrap your hair or mold your hair straight back. The main goal is to achieve the flattest surface for the lace wig. Do I have to shave my hairline back prior to application? No. You do not have to shave your hairline, it completely depends on your preference. You can achieve a natural look without doing this. There is not need if you are wearing a glueless unit. How long can I keep my wig on? The amount of time you will keep your wig on depends on your preference. Once you decide how long you would like to wear your wig, you will then choose an adhesive based on the hold time. For a hold of up to 6 weeks, we recommend Ultra Hold Adhesive. For a hold of up to 10 days, we recommend Davlyn (green label) adhesive. Please be sure to check the hold time for each adhesive listed under the product description to make sure the adhesive is right for you. You may view all our adhesives here. Glueless Units do not require any adhesive. How do I remove glue from my lace? You may try to slide your lace wig on glass surface (such as a mirror), the glue will rub off on the mirror surface. You may also try using 91-99% alcohol and a cotton swab. No need for the Glueless UNITS!!! To participate in our Wig Payment Plan please contact us via phone at 901-832-2291 or email us at customerservice@iwantalacewig.com. Someone will contact you within the next 24 hours. THIS IS NOT A DISCOUNT. This will allow you to pay a deposit of 60% to begin the production of your lace wig. Once your unit is completed and ready to be shipped you will be notified and sent a final invoice for the FINAL PAYMENT. The FINAL PAYMENT is the amount being removed from this invoice. We can not ship your unit until we receive the FINAL PAYMENT. If FINAL PAYMENT is not paid within 15 business days of the final invoice you will be charged a $50 late fee. In addition you will forfeit all deposits/payments if we do not receive your FINAL PAYMENT within 30 days of final invoice. Please send us the final payment at the time we notify you and we will ship your new unit to you within 24 hours. Please note that by paying this invoicing you are agreeing to our terms stated in our Wig Payment Plan. Shipping for stock units will take 4 to 5 business days in the Memphis and surrounding areas. There may be an additional 2 to 3 days if the order has to be shipped out of state. Custom orders will take about 28 business days or 15 business days for rush orders. Rush orders are an additional $50.00. There is a $75.00 restocking fee on all returns. The lace must not have been cut or the hair can not be altered in any way in order to return the unit. NO REFUNDS on custom units. Look good and feel good with your Girlie Lace Wig!!! 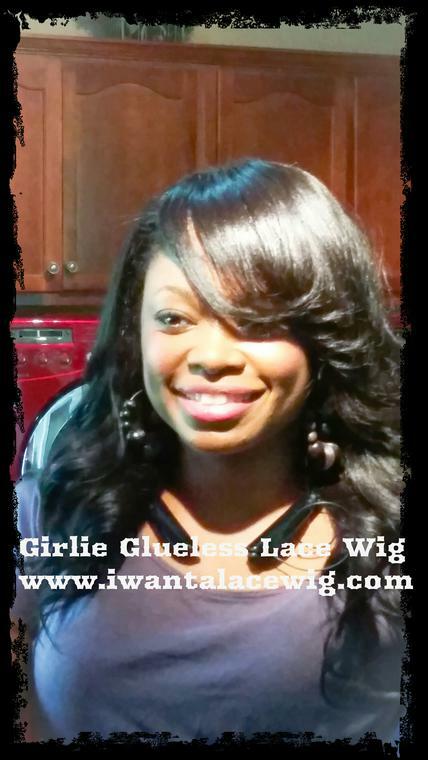 #SAVE THE EDGES with your Girlie Lace Wig "GLUELESS" Unit TODAY!!! !